After exploring current global, national and local environmental challenges, Eltham's student group were unanimous in wanting to care for their school environment and clean up under the school deck. They were overwhelmed by the amount of litter that had accumulated over the years and wanted to take ownership of the problem. Working with the caretaker to remove part of the decking, they gained access to the rubbish and undertook a litter cleanup. This process was documented with photos, from which the group created a slideshow presentation. They created awareness of the issue with the whole school by sharing this at assembly, with the aim of preventing further litter issues from becoming a problem a the school. Eltham students sort the litter collected from under the school deck to identify recyclables. 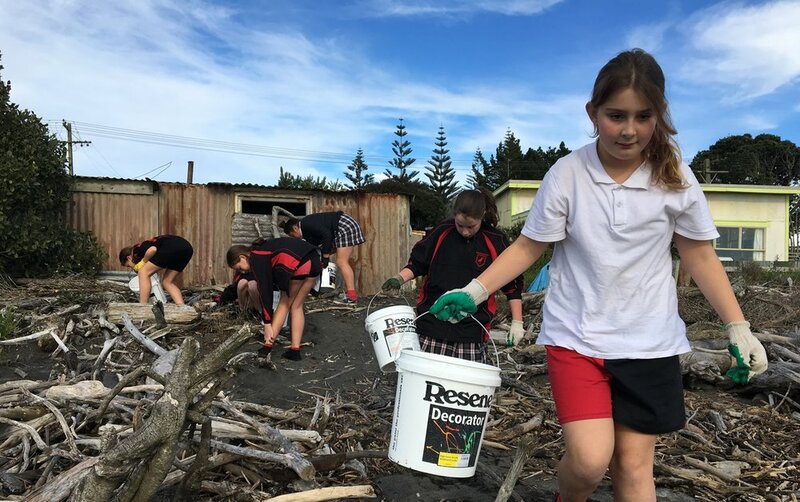 After exploring current global, national and local environmental challenges Patea Area School students were interested in initiating a number of projects. After some collective decision making the group decided to focus on growing local food to address the issue of food miles and the pollution created through international food trade. There were existing vegetable garden beds at the school, which were in need of some maintenance. While the beds were prepped students learnt about raising seedlings, before planting out the garden with winter vegetables. They also designed and built an upcycled cold frame/mini green house for raising seedlings in spring. To do this they pulled apart old pallets for timbre and used around 70 soft drink bottles to make an insulating lid. Patea students with their finished cold frame and new garden sign. Devon Intermediate students were interested in clean water. Around this theme they came up with two projects, a beach clean up to prevent waste plastics from entering the ocean, and investigating and addressing local fresh water quality issues. After presenting to the school's Principal to seek permission to implement their projects, students researched and undertook water testing of the stream at school and planted 50 riparian trees next to the stream. They also planned and implemented a beach clean up, created a sign to help educate the school about the affects of plastic pollution, and made a video to showcase their efforts to the wider school community. Devon Intermediate prepare to audit the beach waste they collected. St Patricks students decided on two individual projects, which were woven together to enhance the outdoor space near the school playground. There were existing vegetable garden beds and fruit trees in this area, and the students wanted to build on these to utilise the space further. Several students were interested in planting more fruit trees and planted a mandarin and feijoa tree, along with building wind break structures to protect the trees. The aim was to provide free food for the school community, Other students wanted to undertake an upcycling project to create outdoor furniture out of waste materials otherwise destined for the landfill. The recycled pallets, old car tires, pillows and blankets to make a set of tables and cushioned chairs for use by students near the playgroup. St Partrick's students celebrate the successful completion of their upcycling project. Starfish students decided to learn about growing their own food. They cleaned up the center's section, mowing the lawns and weeding the garden, then designed a space for vegetables and fruit trees. The students learnt how to plant and prune the fruit trees, which were donated by Aden Lowe of The Fruity Gardener. They also learnt how to how grow vegetables from seed and to plant and care for the seedlings in the garden. These plants will be harvested by the next group of students at the center and used to prepare their lunchtime meals. Spare seedlings were taken home so that the students could share their new skills and knowledge with their families and caregivers. This very enthusiastic group were upset by the litter on the school grounds and wanted to make a change. They collected the rubbish around the school and then organised a beach clean-up at their local beach. The waste collected was audited to see what sort of items were an issue in the environment, with the students finding that polystyrene was a real issue on the beach. With this information in hand, they made a sign from the litter they collected and presented this at a school assembly. Their goal as to educate fellow students that litter can end up in our ocean and to show them the damage this does. Manukorihi students cleaning up Waitara beach. Students at Stratford High decided they wanted to better understand what happens to their food waste and how they could divert it from landfill. In particular, the group was interested in collecting food scraps to feed chickens, which would like at the school. In pursuit of this they decided to undertake an audit of school refuse. Rubbish from 3 school days was collected and sorted, with the results extrapolated to give an indication of weekly waste streams. They found there would be around 50 kg a week of food scraps, which would feed quite a few chickens! Following the Impact project the next step for the group is to take this information to the school Board in support of a proposal to introduce chickenson site at the school. The waste plastics pile after the Stratford High waste audit.